The other day, I was talking to a close college friend, who has been a big supporter of Elementum Money. Veering towards Personal Finance as usual, we started talking about how important investing at this age is for all of us to ensure we are financially sorted by the time of retirement. As we talked about it, she said that one of the things which sometimes baffles her is how much would be enough for retirement. Wanting to make it easy for her, I told her to give me some figures and I could plan it out for her. Being my friend, she said she would rather do it herself. 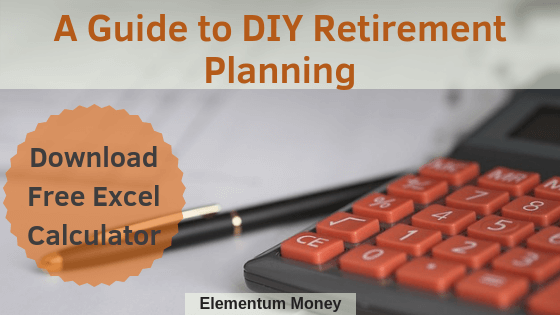 Since Elementum Money is all about enabling and empowering wherever possible, I realized a DIY Guide to Retirement Planning would be something other readers could also find useful. So, here you go PM or PG, whatever you choose to call yourself these days! While retirement planning can be a simple process, what makes it complicated is our fuzziness with what that period looks like in our life. What is an ideal retirement time for you? What do you foresee your retired life to look like? While our plans can always change and nothing has to be written in stone, some vision of what are you trying to fund is important when you plan how to accumulate that money over the years. Not only is this a great exercise in visualization, it also gives you a much-needed starting point to the first requirement into calculating how much funds you would need by what age. In fact, research has shown that when we look at a computer-drawn older self, we are more likely to start saving and planning for retirement. I am pretty sure the more mind space you give to the idea of retirement and how you can make the most of that time, the more you will make sure you add money to that dream. So, as a part of the conversation that I had with my friend, I realized that having a DIY excel calculator for retirement planning was something anyone could use. Read on for 3 steps to using this excel calculator for a customized view of how much would you need for retirement and how much can you look to invest every month through SIP to get to your destination. The first thing that you need to decide is by when you want to have the choice to retire. Make sure this age that you do decide on is not one year beyond 60. Even if, like me, you might be of a mindset of never wanting to retire, financial planning for retirement is something that should be completed by 60. On the other hand, if you are one of the many burned out millennials who can’t wait for the day that they could be financially independent, retire early and never have to work a day, then feel free to play around with the calculator to see how your expenses toggle with the different options of retirement age as per the number of years left to accumulate the corpus. Also, as of now the age till when the corpus should last has been taken to be 85. If you think that’s too high, keep it that way still and any leftover money could work as your inheritance to the next generation or to charity. This is another vital input into your retirement planning. Get an idea of what your core expenses are today, excluding aspects which you foresee disappearing in the future for instance child rearing expenses or house rent as you would have paid off the loan. Ideally, keep the bare minimum expenses and add in any indulgences like travel to come to an average monthly expense. While you may or may not feel the need for it today, this calculator also takes into account a separate medical expense corpus to be accumulated over the decades. Having met so many clients in their sunset years, the one thing I have heard from them is their woes of medical expenses, which a lot of health insurance policies also choose to side step. For the medical corpus, the default amount is kept at Rs. 10 Lakh in today’s terms. For both these expenses, the sheet automatically adds the impact of inflation so that you are well prepared at the time. While investing for retirement, there are two ways that you can go about it. You could either choose to keep the SIP amount uniform over the years. Or you could decide to step up the amount by hiking it every year, in line with the increments at your job. My suggestion? Add in all your details on the Sheet labelled “Equal” to get your customized monthly SIP amount for an adequate retirement corpus. If you feel you can invest that amount every month, then start with the amount right away choosing to use incremental amounts to meet other financial goals. In case, the resultant EMI amount from the “Equal” sheet looks too steep, take a realistic increment amount in the “Step Up” sheet to bring down the initial amount a bit. However, remember that the Step-up method will require far more discipline from your end and ideally a professional advisor to keep you on track rather than the Equal method which can easily be a lock it and forget it method. The excel calculator is fully formula based. In case, you end up messing one of the formulae, just download the sheet again and it will be back to normal. The cells highlighted in green necessarily require input from you to ensure customization of the plan. There are some other cells marked in orange which merely reflect the assumptions taken, be it for inflation, rate of return during accumulation or rate of return post retirement. The rate for inflation has been assumed at 5%, for returns in the corpus accumulate phase at 12% (long-term post tax equity returns) and the returns on the corpus post retirement have been assumed to be 8%. These are generally taken as industry standards and should be worked around. In case, you already have some funds marked out for retirement, then add those in cell E3 as they form the base for your compounding in the years to come. While the currency in the calculator is kept at Indian Rupees, ideally it is universal and can work for any currency. The first step to any big challenge is the recognition and the commitment towards getting there. If you are on this post and have downloaded the calculator, congratulations on your first move. Get cracking on figuring out the best route to a well planned retirement and then follow through on this plan. If you have any feedback on the calculator, I would be delighted to get your views on the same in the comments below.